Tariff proposals and enactments continue to build in recent months. The situation has not risen all the way to a full-blown trade war, or at least not yet. But we need to call it something. Trade fisticuffs doesn’t quite sound right, so let’s go with trade skirmish for now. 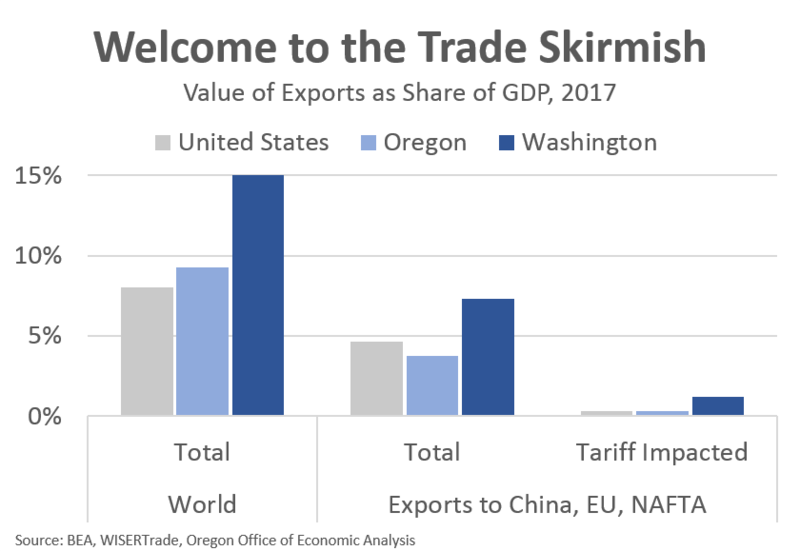 This post largely builds upon previous work from our office on global supply chains and Oregon’s direct trade exposure to China. The upshot of the trade skirmish remains that the direct exposure of goods subject to tariffs is small when measured against the size of the economy. Yes, we’re talking about nearly $60 billion worth of U.S. exports, but in a $19 trillion economy that represents 0.3 percent. And even as these exports will decline some, they will not go to zero overnight. Given the relative size of the tariffs, some forecasters are not adjusting their outlook at all, while others are revising down their growth expectations a hair, something like shaving 0.1 percentage points of growth off their 2019 GDP forecasts. As such, the real macroeconomic concerns remain focused on continued escalation across products and/or involving more countries. The reason for the concern is that we now have integrated, global supply chains. While goods producing industries rely more upon imports than other sectors, every single industry imports something. As Moody’s Analytics writes in their trade report, “higher tariffs change the economics of the supply chain. If the tariffs remain in place long enough, they will cause the chain to shift.” They go on to note that this shift, should it occur, will be highly disruptive. Economist Paul Krugman, Nobel winner for his trade work, notes something similar as well. The big picture concerns aren’t where things stand today, but where they may head in the future should a full-blown trade war occur. This next chart tries to show overall trade exposure for the various subsectors within manufacturing. On the horizontal axis is a measure of import exposure, while on the vertical axis we look at export exposure. The size of the bubbles represent the size of industry output. A few subsectors stand out. First, petroleum and coal manufacturing uses a lot of imports but the U.S. exports very little of these goods. Second, transportation equipment (autos, aerospace) is a big sector with both imports and exports that are significantly above average rates. We know this industry has a true global supply chain. Third, computer and electronic products have a small share of import exposure but the highest export exposure across manufacturing. Here in Oregon we know a lot of these exports represent within firm shipments to assembly plants around the world, but I cannot speak for the other 96% of these exports. 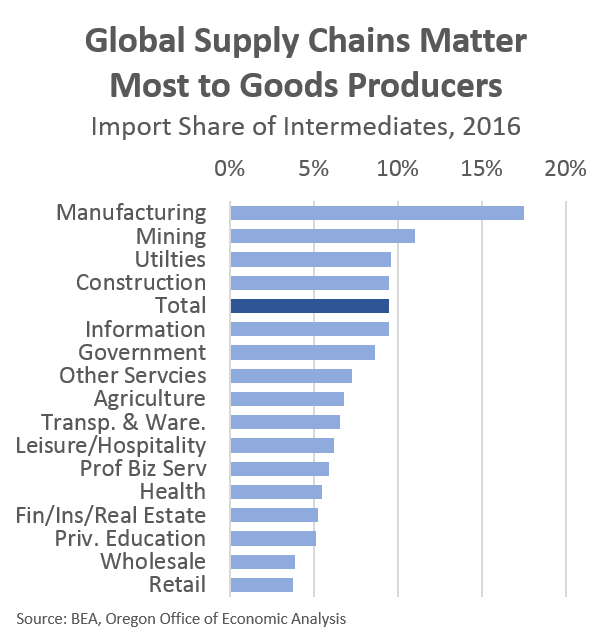 Finally, sectors like food and beverage, wood products, printing and the like have relatively small trade exposures as they rely on U.S. grown or produced inputs and sell largely to the domestic/local market. For Oregon specifically, we are now talking about $800 million worth of goods subject to the enacted or proposed tariffs. Within these tariff impacted exports there are two groups. The first is composed of Oregon-made products that are sold abroad. This includes wheat heading to China and wood products heading to Canada. However the second group of products represent things that aren’t necessarily made in Oregon, but for whatever reason get coded as Oregon exports. This includes the passenger vehicles and soybeans heading to China. Now, Census and WISERTrade do their best in coding exports back to where they were made, but there are limitations to their data and efforts. Additionally, while these products may not be grown or produced in Oregon, they do have a local economic impact in terms of port jobs, transportation, warehousing, logistics and the like. 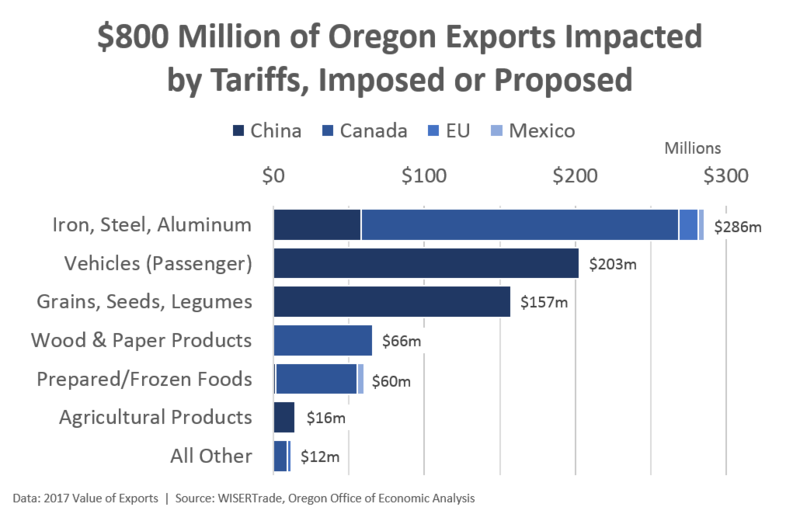 So a decline in these exports nationwide would have a local impact as well, just not nearly as large as if those good were made here in Oregon. 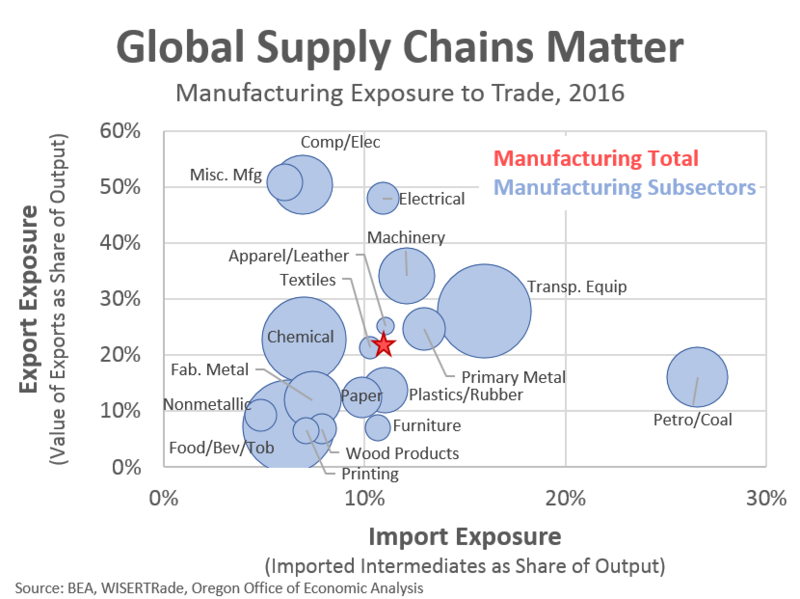 Finally, it is highly likely that some Oregon-made products get counted as exports to other states as well, so the real world impacts will not be confined to what is seen above. Bottom Line: The trade skirmish is here. Tariffs are raising the prices of some imported goods and will curtail some exports as well. To date these actions have minimal macroeconomic impact, even if specific businesses and industries see larger changes. The real concerns lie with continued escalation that would eventually disrupt the global economic supply chains. Should this come to pass, the economy would see noticeable impacts. Moody’s Analytics, in their trade war scenario, pegs the decline in GDP relative to baseline around 1.5 percentage points and more than 2 million jobs nationwide. In a full-blown worldwide trade war where international trade falls by 70 percent, Krugman finds a 2% GDP decline is plausible. That is an outright decline, not a reduction relative to the baseline. Again, the economy is far from these potential scenarios today, however there does not seem to be a clear resolution in sight either. 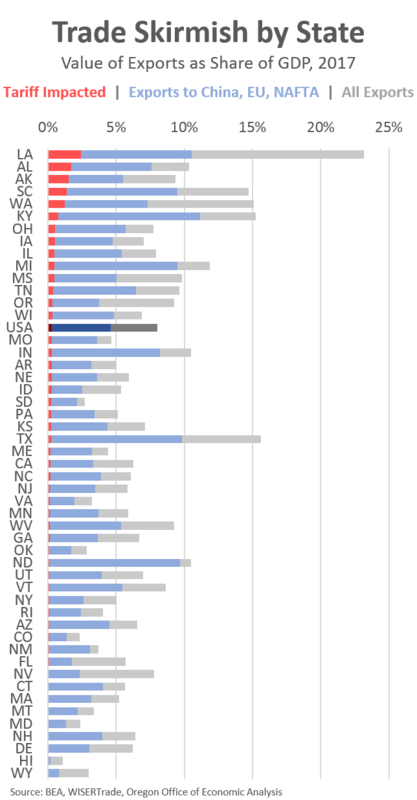 Addendum: A look at export exposure across all states ranked from the highest to lowest in terms of the size/value of their exports subject to tariffs.